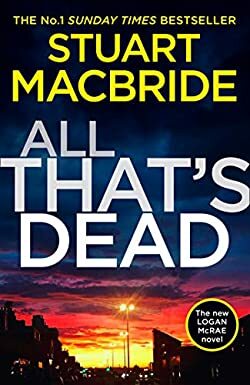 Stuart MacBride is a Scottish author best known for his Logan McRae series set in Aberdeen, and his shorter Ash Henderson series featuring a Detective Constable whose family and career are destroyed by a ruthless serial killer who disappeared. Until he came back. Here are all the Stuart MacBride books in publication order, with the reading order listed in brackets. The two main characters in the Stuart MacBride books are as different as they come. Logan McRae is a well-loved team player who never breaks the rules. He actually hates anyone who does that. He goes very much by the book, and when in dire situations, he doesn’t go all hero out on his own but calls for backup. He is a typical modern police detective, a good guy whom you simply can’t even imagine doing something illegal or even wrong. Logan is a relatively happy guy, and some of the dialogues involving him are relatively humorous. Ash Henderson, on the other hand, is almost the opposite of Logan McRae. Ash is an old-school policeman who doesn’t like rookies the way Logan does. He doesn’t have qualms about newbies falling off the ladder a few times to learn the ropes. He is much darker than Logan, and if he believes someone’s guilty, he wouldn’t be much above helping him break his neck in the process if it could help. Ash had a very difficult life, and his outlook on life is pretty dire. The books with him lack the humor that you can find in the Logan McRae stories. Also, Stuart MacBride put Ash through a lot of pain in Birthdays for the Dead, both emotionally and physically. So much that when the author finally wrote the second (and sadly the last) book in the short series, he gave Ash a limp. Born in Dumbarton, Scotland in 1969, Stuart MacBride (website) was raised in Aberdeen from the age of two. Before he became a writer, he had a wide range of not-so-long-lasting jobs including graphic design and web design, computer programming, actor, undertaker and project manager. Luckily (for us, readers) none of those jobs lasted too long because now we get to enjoy his much more interesting books about life and crime in Aberdeen. As a child, Stuart MacBride never really thought of writing books. It was in his 20es when he started thinking about it due to peer pressure from friends who said it’s fun to write books. As such, Stuart doesn’t really have any formal training in writing books. His books are in the genre of Tartan Noir, which is Scottish crime fiction that borrows elements from other countries’ literature as well. In addition to the Logan McRae series, the author has also written two books in the Ash Henderson series set in a fictitious town of Oldcastle, two standalone novels, and several short stories. The Logan McRae books are all set in actual locations, where the author is writing about real places for the background scenes. However, the two Ash Henderson books are set in a fictional town called Oldcastle. The reason is that the police officers in the Ash Henderson series are not entirely above the board. They are often corrupt and don’t shy away from doing things their way, so the author didn’t want to offend the police department of any existing city or town. What is interesting though is that for the Ash Henderson series, Stuart MacBride mapped out out the entire town and created an actual map of the place as if it were real. The first Stuart MacBride book that was published was Cold Granite, which was, in fact, the author’s fifth written novel. The first four were not considered good enough for publication, so Cold Granite, the author’s debut novel became his first. When he plots the storyline, Stuart uses mind-maps which help him connect all the different little plots. This way he can go with the book in any direction he wants. Often, the twists in the story come to him while he is in the actual process of writing. All the characters in his books are well fleshed-out and have a life of their own, even the villains. In an interview, Stuart MacBride mentioned that as long as each character believes he or she is the hero of their own story, they can take a life of their own and break away from the mold of 2-d character that is so prevalent in crime mystery books today. Currently, the author Stuart MacBride lives in north-east Scotland with his wife Fiona, and his cat. He has received several awards for his books. In 2007, Broken Skin took the CWA’s prestigious Dagger in the Library, and the following year, in 2008, Stuart MacBride received the Breakthrough Author of the Year in the ITV3 Crime Thriller Awards. Boy what a job to find the list of Stuart MacBride’s books. Couldn’t find it on his own site, the BOOK icon took you to one or two books available to buy but not a list of all books written by him. Still I love his novels and hope that there will be a follow on for ‘In The Cold Dark Ground’. That’s fabulous!!! Just love Laz and Roberta . Best crime fiction I have read for ages and I really Must visit Aberdeen when I am next in the UK – preferably in the summer. Thanks for such great books!!! I’m not sure yet, but I know that the author signed a 3 book contract with Harper Collins, out of which 2 will be Logan McRae and one either standalone or part of Ash Henderson, we’ll see. So I’m thinking either 2017 or 2018 we’ll have the next Logan McRae book (here’s hoping for next year).